This software offers a solution to users who want to block one or more specified websites. Website addresses (urls) can be added individually or by loading them from a file. There is an option to protect this process so that your settings cannot be changed without a user specified password. There are check boxes to allow the software to load on windows startup and to reside in the system tray. 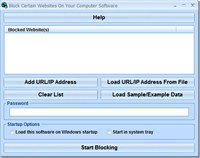 Block Certain Websites On Your Computer Software is a security program that works under windows xp, windows vista and windows 7. It supports both 32-bit & 64-bit windows editions, therefore it could run faster on 64-bit computers. Estimated download time for Block Certain Websites On Your Computer Software on a common adsl connection is less than a minute. 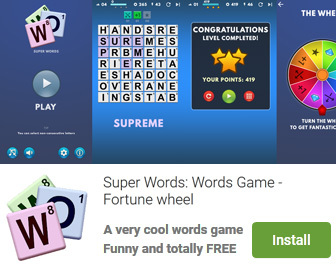 Version 7.0 was released three thousand two hundred twenty three days ago by Sobolsoft. Click the green download button to download it now.